I have been very quiet of late, but thats only because i have been busy sewing. Not a lot of sewing for myself but i have managed to get some presents made for swaps and birthdays. 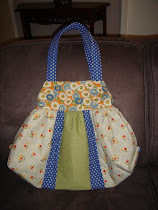 It is a relief to write that i have finished the bag i am swapping in Linda's bag/bucket swap. I am usually quick to start but very slow to finish when it comes to bags, but this month i have finished 2 and am part way through another. Here is a bit of a look at what i have made. I hope my swap partner likes neopolitan ice cream. It's nothing like the first peek i gave a few weeks back. 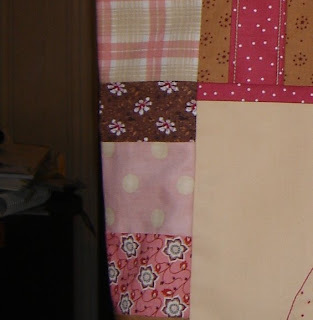 While i really liked what i had originally started making , i decided that it was far too cutesy and set about making another bag based on one that my eldest sister had made me years ago. 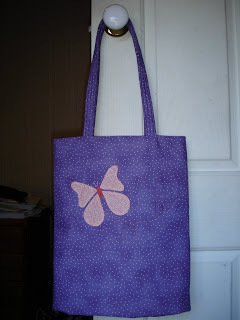 The 2nd bag i made is a present for a little girl turning 9. It is a great little bag, very simple but still pretty enough. 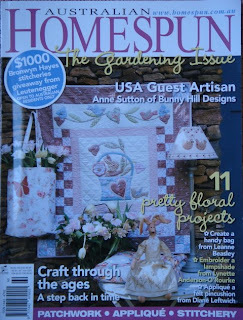 It is from a pattern by Leanne Beasley in the latest Australian Homespun magazine. 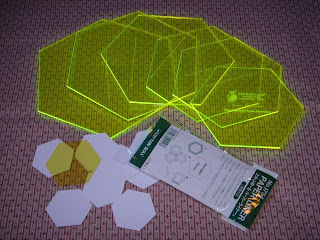 Hexagons are popping up everywhere and when my friend Lynda had some on auction i couldn't resist grabbing them. I'm not sure exactly what i plan to do with them, but having them ready and on hand when i do decide is the bestest. I love frogs ! I think they are fabulous little creatures. 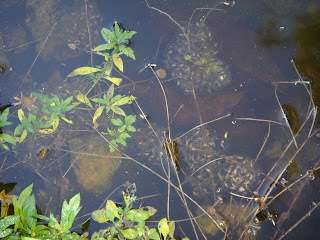 And it is very exciting that soon we will be playing host to oodles of wiggly little tadpoles. Its not our first time as foster parents to lots of taddies, last year we had a swimming pool full of them. Sadly, that didn't end so well for the late bloomers, but fortunately this year the frogs have restricted themselves to a little derelict pond. Once these little guys grow up there is going to be a massive population explosion (much to my hubby's dismay...... he thinks they're "noisy little buggers"). This pond really isn't a pretty sight. We were ready to pull it out back in February but once the rains came it filled up again and became the nursery that it is today. 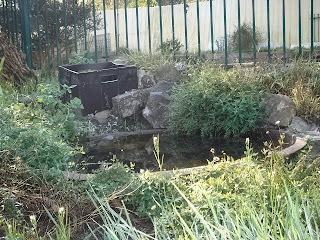 We will have to get in much quicker next year so that a new pond can be nicely established somewhere nearby for the next round of frogs and their offspring. Yippeeeee! The sun is shining and the sky is a brilliant blue. I can't wait for Spring !!!!!! Thank you for all the advice on managing sore over-worked shoulders. I am feeling better...... not 100% yet, but getting there. 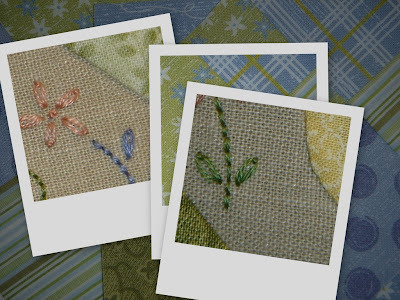 All would probably be great if i could stop myself from picking up needle and thread but that is a near impossible task. Anyway using my loopy logic i decided to do some hand piecing, since it was a stitchery which first got me in trouble. Not real smart i guess, doing anything by hand is the problem. But i am pleased with what i have to show for my time and aching arm. From yet another blog tutorial..... who can resist trying them all out ? This is from a great pincushion tutorial by May Britt at Abyquilt . Silly me made my flower upside down by getting my piecing a little muddled up, but i still like the effect it created. May Britt has a few lovely tutorials that really need to be checked out. There are also a few giveaways happening at the moment too. Lila Tueller Designs is in the last days of her gorgeous giveaway. Candace at Wraggedypatches is celebrating 100 posts. Cheryl at Polka Dots and Rick Rack is celebrating her blogiversary. Warning - Stitching can be hazardous to your health! I was having such a lovely time this week. I was ahead on the housework front and able to indulge in lots of stitching, but it's come back to bite me. I've managed to over-stitch and caused myself an injury of sorts. Nothing major or dramatic and all self inflicted due to my poor hoop holding technique, but not what a girl wants or needs. Basically the muscles in my left shoulder have stopped playing the game due to being held in one position for hours on end and those unhappy muscles are causing me some very unwelcome pain. Moan, groan. This block is just one of the culprits in my incapacitation, the others were probably the stitchery blocks for the bag/bucket swap bag I am making. Either way this does bode well for me finishing my Butterfly Garden block before next weeks class. Not happy Jan. I decided to get started on my bag for Linda's Bag/Bucket swap and have made some good progress so far. A little more stitching and i will be ready to put it all together. Here is a bit of a peek at how things are going. I know it doesn't reveal a lot but you can get an idea of colours etc. It's just as well i am on track with this swap as i have signed up for a couple of others that are happening soon too. 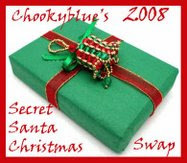 The first is the Stitchers Angel swap organised by Helen at Hugs & Kisses and the second is Chookyblue's SSCS 2008. Hmmm.... wonder what i can come up with for swap partners there ? On the giveaway front :- Maree over at Farmyard Crafts is having a 50th post giveaway until the 10th of August. So head on over and say G'day. Last week i was trying my best to be a good "Holly Homemaker" and as a result the house isn't looking too bad and the mountain of washing i usually have to face is down to a mole hill. So today, i can happily do some stitching without feeling the big guilt. "Sigh"
And now it's time to stitch.